Hello everyone! Look who’s back! Fortunately, the last one turned out just fine and yummy! As you may notice from the lengthy title, this could easily be labelled an everything-but-the-kitchen-sink dish but it not really is. About a year or so ago, I sort of came up with this one-dish meal of roasted aubergine with yogurt, pistachios and cinnamon. Having an aubergine in my fridge and pistachios in the cupboard, I felt like making a more presentable dish of it. 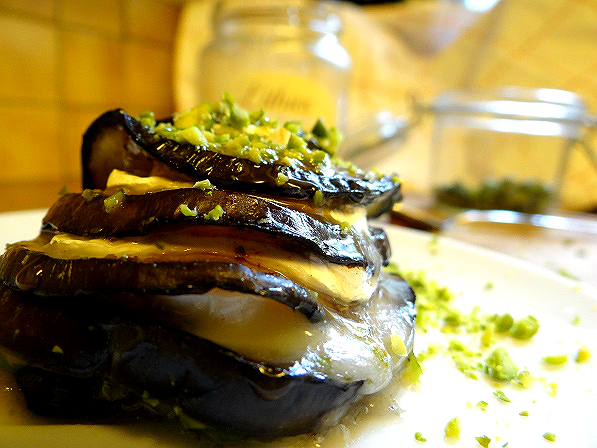 Cut the aubergine into 0.5 cm/¼ inch slices. Brush oil on both sides and lightly fry for a few minutes over medium heat. Cut the cheese into 0.5 cm/¼ inch slices. To make the mille-feuilles: on a slice of aubergine, add a slice of goat’s cheese, a pinch of cinnamon and a pinch of pistachios. Continue until there are no ingredients left. You can also make 2 or 4 small mille-feuilles, which will be more stable. Bake for 5 to 10 minutes, until the cheese has melted. Once removed from the oven, drizzle some honey and pistachios and serve immediately. It looks yummy so it must be also, only i dont like cinamon, so canI use nutmeg instead of cinamon or some thing else?